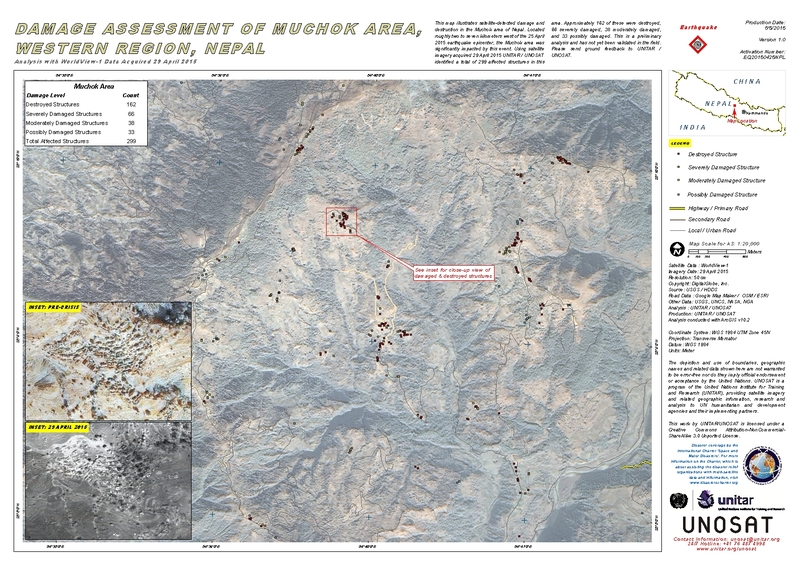 This map illustrates satellite-detected damage and destruction in the Muchok area of Nepal. Located roughly two to seven kilometers west of the 25 April 2015 earthquake epicenter, the Muchok area was significantly impacted by this event. Using satellite imagery acquired 29 April 2015 UNITAR / UNOSAT identified a total of 299 affected structures in this area. Approximately 162 of these were destroyed, 66 severely damaged, 38 moderately damaged, and 33 possibly damaged. This is a preliminary analysis and has not yet been validated in the field. Please send ground feedback to UNITAR / UNOSAT.